You know how turtles and tortoises move very, very slowly? Turns out there's one way they're incredibly fast: moving toward extinction. 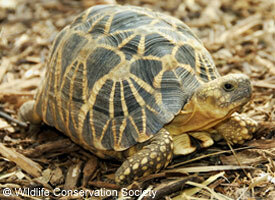 More than HALF of all freshwater turtle and tortoise species worldwide are threatened with extinction. If we don't take immediate measures to protect these animals, many could be wiped off the face of the planet. But Congress is actually considering making cuts to the programs that would save them. Yikes! Congress is still marking up their budget for the next year. That means we have an opportunity to stop our leaders from cutting conservation programs that could save turtles and tortoises. I'm worried that we're going to lose a ton of important species if they make these cuts, so I sent a letter to my members of Congress to make sure they know where I stand. Will you help me increase the pressure on Congress by sending a letter too? It won't take long, and it'll make a huge difference for freshwater turtles and tortoises.